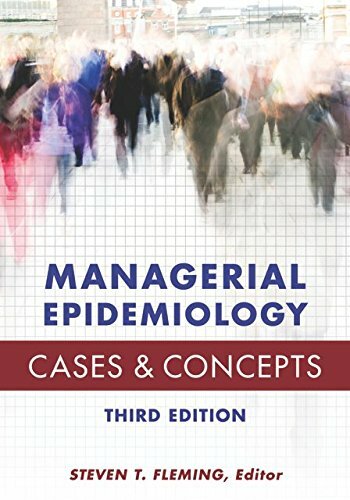 Managerial Epidemiology: Cases and Concepts provides an introduction to epidemiology and explains how to use epidemiological concepts and tools to improve decisions about the management of health services. As health administration becomes more focused on population and community health, understanding the impact of disease on populations in a service area is more important than ever. This book blends theory and application by presenting basic principles and expanding discussion on healthcare management in chapters that are filled with case studies, examples, and exhibits to reinforce concepts. A new chapter on the importance of epidemiology for both public health and healthcare leadership is included, along with three application chapters that focus on the health of populations with three specific diseases. A new appendix of formulas has been added, along with an in-text glossary. Fifteen new in-depth capstone cases expand on concepts covered in the book. The capstone cases can be used as problems sets or exams, or they can form the foundation for a case-study approach to classroom instruction. Answers to the capstone cases are stored in a secure page in the online Instructor s Resources for this book. In-chapter cases are accompanied by in-chapter answer guides. These case/answer guide combinations are presented as an integral component of the learning process offered by the book. By working through the cases, using the answer guides, students will learn new material and gain application reinforcement of concepts presented elsewhere in the chapters. End-of-chapter cases provide additional exercises for application practice. Answers are provided at the end of the book so that students can self-quiz and use the cases to build their understanding of epidemiology.